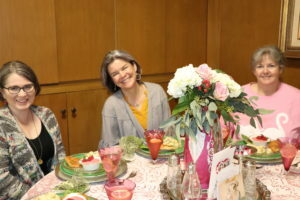 Guest Speaker Katie Hays, center, enjoying lunch with women at the luncheon. Katie currently pastors Galileo Church, where LGBT and neurodiversity are welcome. However, Katie grew up in a more traditional congregation, one where women did everything. They tended the nursery, cooked the pot-lucks — literally kept the church going. As Katie grew older, when hearing Biblical stories spotlighting men, she wondered where the women were and what they were doing. She began to examine the female Biblical characters behind the scenes and their roles in the early church, bringing to focus a subject still prominent in our lifestyle today. Lunch was tortellini with prosciutto and peas, raspberry compote, with a sweet ending of assorted brownies and chocolate dipped strawberries. And love it was — a lovely valentine for all. You don’t have to be a member of Central, or any church for that matter, to be a part of this great group of women and the educational and entertaining programs that they enjoy. Spring will bring a field trip to the Christian Arts Museum in Fort Worth with lunch at the famed Joe T. Garcia’s Mexican restaurant. Email Shelia Huffman at shelia0806@sbcglobal.net for more information or contact Laura in the church office at 214-526-7291 for an event schedule.